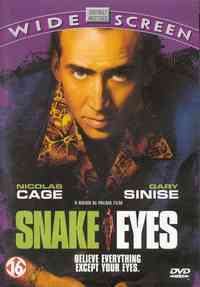 From its sensational opening shot to its atmospheric final showdown, Snake Eyes seethes with inventiveness and suspense. Nicolas Cage and Gery Sinise star in the acclaimed Brian De Palma thriller that combines the glitter, glamour and bedlam of a heavyweight championship fight with pulse-pounding mystery and excitement. Cage plays Rick Santoro, a flamboyant Atlantic City police detective who's come to watch the fight and cash in on the hectic betting action. Suddenly, gunfire cuts down a ringside government official, and 14,000 fans suddenly become 14,000 suspects. What eyewitnesses saw, what a casion-wide spycam network reveals and what a mysterious woman in white knows - all lead to a shattering truth Santoro does not want to believe.